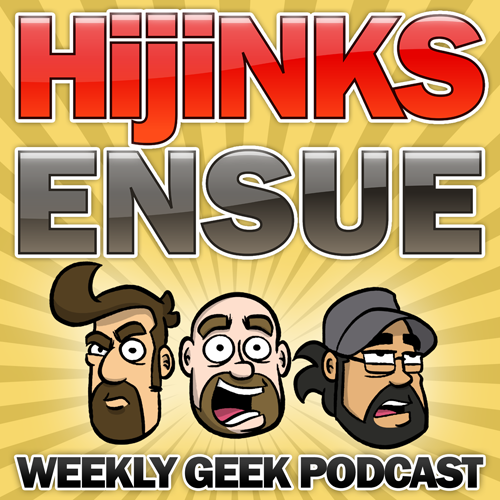 Beginning in February 2008, The Classic HijiNKS ENSUE Podcast is the original "geeks talking pop culture" podcast. Host Joel Watson, creator of the online comic HijiNKS ENSUE, and his co-hosts, Josh Jeffcoat and Eli Luna, break down the week's geek news and give their own perspective on current events in pop culture. After a hiatus from April 2011 to August 2012, the show returned with an updated, more conversational comedic format without the focus on geek pop culture. It also featured an array of guests and co-hosts, including the creators of the popular online comic Cyanide & Happiness. RATING: Often NSFW, Definitely Not Safe For Kids due to adult language and subject matter. Episode 92 – He’s Dredd, Jim. Episode 90 – BONE TOKENS! Episode 86 – Oh No! Promotheus! Episode 72 – You Like’a Da Joose! Episode 66 – Galaxy Class P.O.S. Episode 24 – You Want the Spicy? Episode 19 – The Longest Podcast EVAR! Episode 11 – 80’s TV Trivia Showdown! Episode 10 – You Maniacs! You Blew It Up!